The Carlex crew never disappoint. The last time we popped over to Carlex Design, creators of some of the coolest interiors we've ever seen, they had just finished customizing a Nissan GT-R. It took an already good interior to something on par with the likes of Pagani. The latest creation to come from the car stylist's workshop is in the form of a Toyota Tacoma. The truck was given a complete makeover, and as expected, inside the cabin things are nothing short of awesome. Starting with the exterior, Carlex beefed up the already rugged Tacoma by adding an almost stealth-like front winch, arch extensions and an LED light bar spanning the length of the top of the windshield. All the chrome has been blacked out, as have the steel wheels that feature larger Cooper Discoverer STT Pro tires that look at home in the now spacious wheel arches thanks to a lift kit. 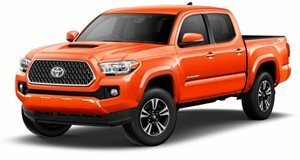 All that's missing in an aftermarket bumper set, but as is the usual case with Carlex, the main point of focus was the cabin of the Tacoma. The changes are so amazing that if you were to be blindfolded and put inside, you'd have no idea where you were. Well, Tacoma owners may be able to identify the dash, but would be mighty confused. Everything has been done in a swampy green color, the leather looks as tough as alligator hide and the Alcantara on the roof lining is a matching shade of green. The stock seats were binned in favour of a pair of race seats, centers feature a custom pattern in black leather and bolsters are green. The dash and door cards are covered in the same materials, as is the rest between the seats. A sports steering wheel is also in play covered in the same green leather with a black center market sewn in. Our only complaint is the removal of the airbagged steering, we quite like life-saving devices. Overall the Tacoma is pure brilliance, and even though it's mainly an interior upgrade, it now looks properly tough.